Hip hop is a form of expression and doesn’t always have to be taken literal. That is exactly what the film industry is as well, a form of entertainment, expression and artistry. I believe in giving the artist freedom of creativity when expressing themselves but also should be responsible at the same time and understand that the youth are more easily influenced by music and words. This track is is by William Cooper and features Autumn Turner on the track titled Pale Horse Rider. Give it a listen and let me know your thoughts. Today, with the world’s corrosive political climate wearing away at the public’s trust not only in government and just about everything else, Newark rapper William Cooper resurfaces with a new video, Pale Horse Rider that urges people to wake up and “ride for your freedoms”. It is a message that echoes Cooper’s namesake and author of one of hip-hop’s favorite conspiracy books, Behold A Pale Horse by Milton William Cooper. A long time journalist based in New York, Jacobson may also be familiar to hip-hop fans as the author of the New York Magazine piece, Return of Superfly, the story of the Harlem drug dealer Frank Lucas. The article was the basis for the movie American Gangster, starring Denzel Washington. Jacobson’s reporting was also the core material for the long-running TV show Taxi. Jacobson met rapper Cooper, who took his name on the suggestion of Wu-Tang Clan stalwart Killah Priest, during their Black Market Militia recording sessions. 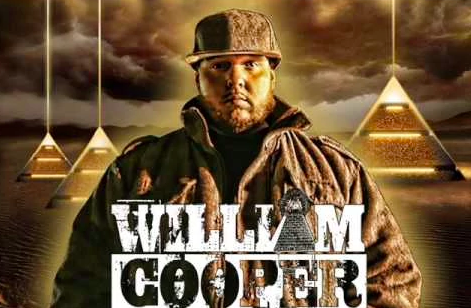 Cooper’s story came to be featured in Pale Horse Rider as a prime example of the cross pollination between hip hop and Bill Cooper’s themes of conspiracy and the search for freedom in an increasing locked down America. The idea for the video grew out of the friendship between Jacobson and Cooper. Cooper’s song, which is also fittingly titled Pale Horse Rider, features soulful songstress, Autumn Turner, best known for her stellar performances on NBC’s television show The Voice (season 12). Cooper and Ms. Turner magically perform off of each other with great chemistry, going back and forth, creating a powerful and catchy chorus that encourages the listener to ride for a better tomorrow. The mesmerizing soundscape produced by skilled beat-architect, Mikey Bingo, holds you captive while Cooper continuously spits thought provoking bars like, “Don’t be leaving breadcrumbs for the Feds, remember who and what you text message lives forever”. The stunningly crisp visuals are shot and edited by Jimmy Giambrone, and also feature cameos of Mark Jacobson, further showcasing the song/video/book collaboration. Mark Jacobson’s Pale Horse Rider: William Cooper, the Rise of Conspiracy, and the Fall of Trust in America can be purchased everywhere books are sold. William Cooper’s song Pale Horse Rider is currently available for purchase and streaming on all major digital platforms.